Gosh, it seems like everytime I use my scraps, the pile doesn't go down. I made a couple cards yesterday using only scraps. I like the idea of making things using up products from your stash. I have stuff I didn't know I had. In fact, I can't find stuff that I thought I had. LOL! 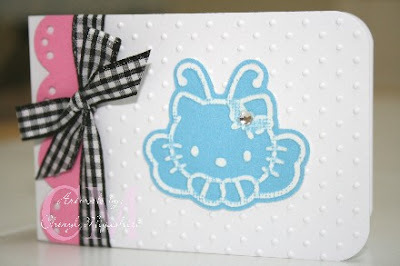 I used all the new Hello Kitty embosslits on these cards. 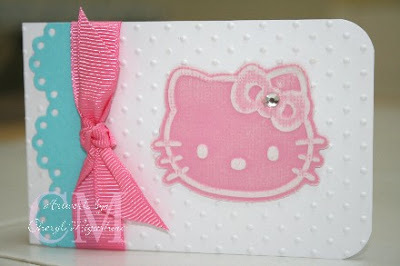 And the scallop border die comes in 2 different styles so you get 2 different die cuts from one die. I made each kitty a different color just to see how it would come out. I like how they all have their own look. Well, thanks for stopping by! I've been having fun playing with all these new dies and using up my stash. they are so sweet! I bought a couple of them...but want to go check out today if he has more. 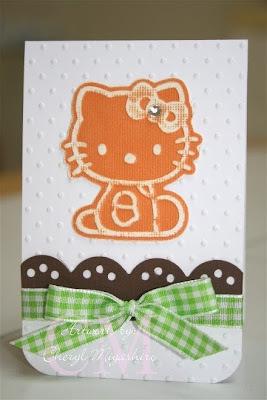 I love how you used the borders on each card...how did you make the card? great cards to have handy just in case. TFS! love how you sanded each one. Aww, these are such cute cards! I bought the HK face and didn't sand mine. I like the sanded look too! Cheryl, these are so cute! Now I have to get all these embosslits! Love these Cheryl! My scrap stash just gets bigger and bigger too. 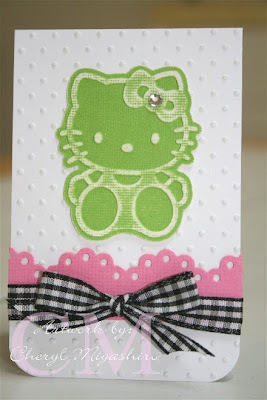 What a good idea to use them for these cards, very green like, hehe. TFS!